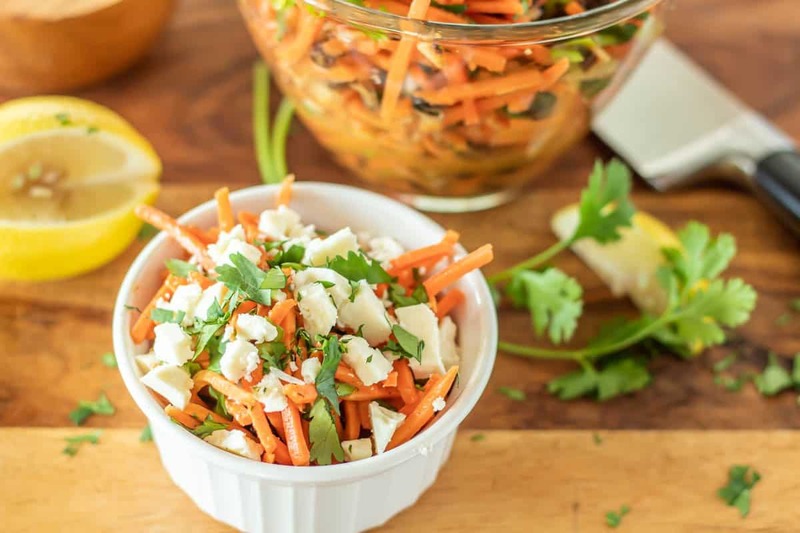 A fresh and crunchy salad of matchstick carrots, toasted almonds, and sweet currants tossed with a sweet/tart lemon and olive oil based dressing… Moroccan flavors sing in my Moroccan Carrot Salad With Lemon Dressing! This is a tasty and quick side dish with a grilled chicken breast, or a perfect light lunch topped with crumbled feta cheese. I tend to focus most of my recipes on main dishes. However, I find myself avoiding mundane sides (think garden salad with vinaigrette) like “the plague,” and constantly find myself looking for new and interesting ways to complement the main dish. 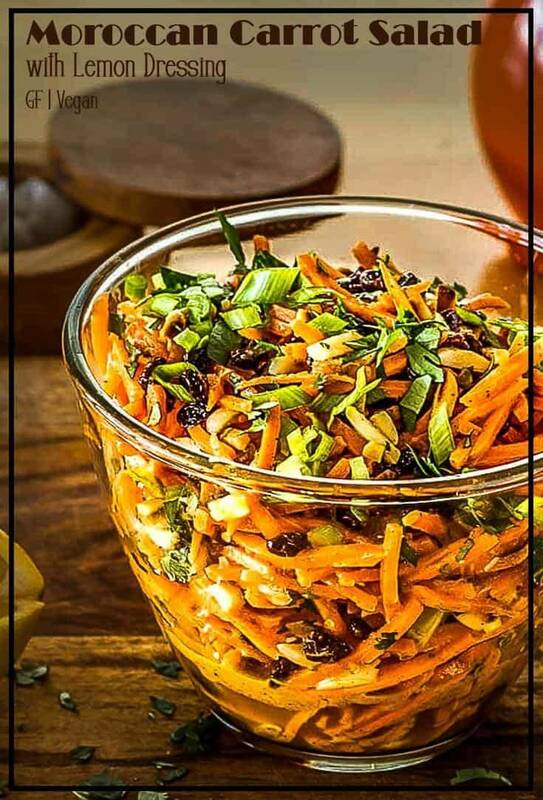 My Moroccan Carrot Salad With Lemon Dressing was one such creative moment that instantly became a favorite. Labor Day weekend, Mark and I had an adventure – we took our new tandem kayak to the Corpus Christi area for its maiden voyage. We travel with a tiny Aliner trailer, and space is tight. I have to plan each meal in advance, and pack carefully. The miniature refrigerator is packed tight, so fragile produce just doesn’t work. Matchstick carrots (available in the produce section if you’d rather not prep your own) have proven to be perfect for our adventures. Paired with toasted almonds and dried currants (no refrigeration required), this dish made a perfect side for our grilled chicken breasts. 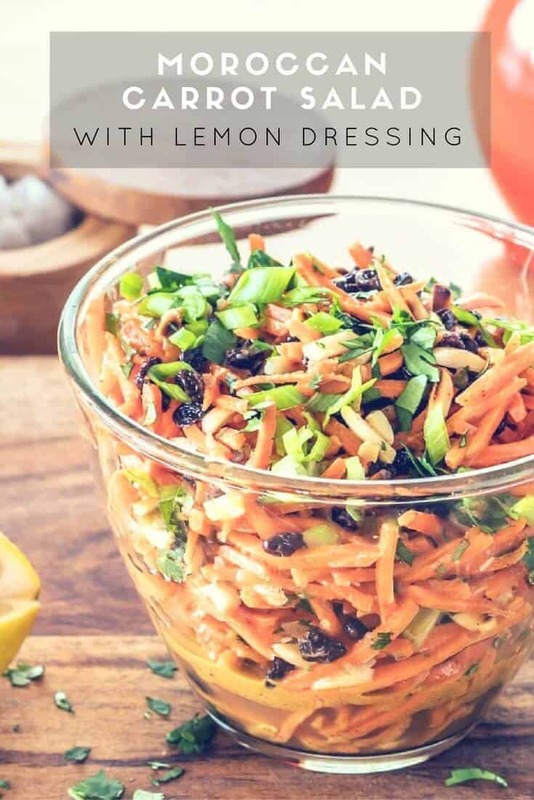 The lemon dressing ingredients – fresh lemon juice, lemon infused olive oil, ras el hanout, cinnamon, orange blossom water, and pomegranate molasses – got shaken up in a mason jar. To save on dishes, I added the currants to the dressing and let them soak while I finished the rest of the meal. 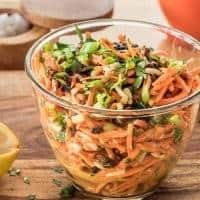 Just before serving dinner, I dumped the bag of matchstick carrots into a salad bowl, added the toasted almonds, cilantro, and scallions, then tossed with the lemon dressing and currants. I have to say, the combination was fabulous! When I made the dish again at home, I made a couple of simple changes: I added a shallot to the dressing then blended it until smooth, and I topped the salad with a bit of crumbled feta. I served Moroccan Carrot Salad With Lemon Dressing with Ras El Hanout Chicken Kebabs marinated in olive oil, lemon juice and zest, garlic, and ras el hanout, then grilled. Couscous and a crisp New Zealand sauvignon blanc rounded out this fabulous Moroccan-inspired meal. My husband is such a good sport, often facing the same dishes several times in one week as I develop recipes and shoot photos… 🙂 I have to give Mark a shout out for his unwavering support! The Moroccan flavor profile has become a favorite; ras el hanout and orange blossom water (a newer addition to my well-stocked pantry) are such intriguing ingredients. There is much to love about this healthy Mediterranean cuisine! Have you had the opportunity to experience Moroccan food in a restaurant or in your own kitchen? If currants are at all dry, cover with very hot water until they soften up a bit. Drain well before adding to the salad. Toast the almonds, chop the cilantro and scallions. Add the dressing ingredients to a personal blender or food processor. Blend until smooth. Set aside. 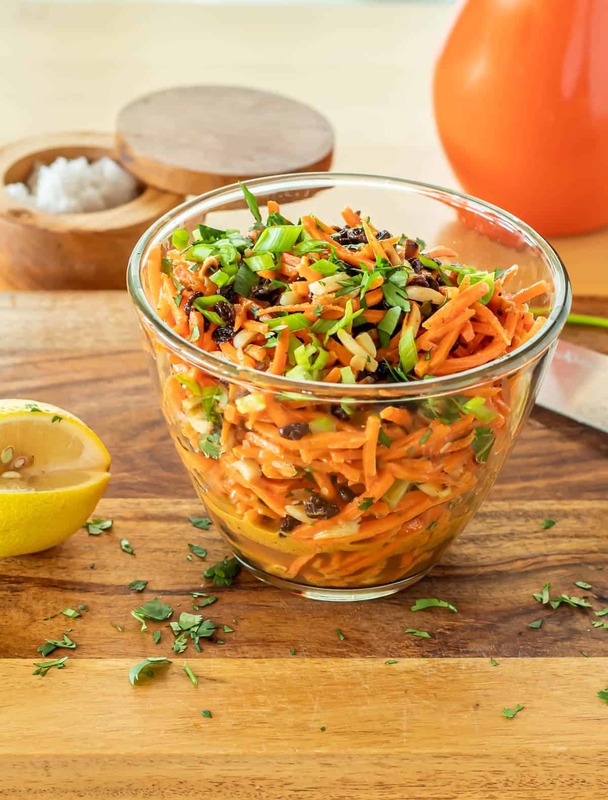 To a medium salad bowl, add the matchstick carrots, currants, toasted almonds, scallions, and cilantro. Toss with the lemon dressing. I buy the matchstick carrots at my local market. You can also use grated carrots. A 10 ounce bag is about 3 cups. I keep lemon infused olive oil in my pantry, and I love layering flavors. Regular olive oil is fine too. Orange blossom water has a long history in Mediterranean countries. It is water distilled with the blossoms from bitter orange trees, and has a complex, slightly bitter flavor. It can be found in the Middle Eastern section of supermarkets and in many ethnic grocery stores. Substitute an equal amount of orange zest if necessary. Pomegranate molasses (or syrup) is reduced pomegranate juice. There really isn't a good substitute, but you can use honey if you can't find it, and don't wish to make it. Loved this recipe! The kids enjoyed it too and I am going to put it into the cook again pool. We adjusted the quantities in the dressing a little to suit the kids but all the elements were still there. Thank you. Yay!!! Thanks for taking the time to write... I am so happy your family enjoyed it Trudie! I love these photos Tammy - and the salad is my kind of heaven. It reminds me of something my mum used to serve up when I was a teenager. I am loving the sound of this! I have some veg box rainbow carrots in the fridge crying out to be turned into this gorgeous salad! I love crunchy salads like this and really enjoy the spices that you used in your dressing, I bet this is delicious!! Yes, I love pomegranate molasses Jennifer! When we lived in Las Cruces, I couldn't get it, so I made my own by reducing juice. It was expensive and time consuming, but there really is no substitute! Yum! I love everything abut this delicious salad. The spices, the sweet currants and carrots and crunchy nuts. shared and pinned! Thanks Bobbi! It's so simple and quick to make, but really is delicious! Made it this weekend and loved it!!! You've know idea what that means to me Bobbi... Thank you! This sounds like a great tasting salad. Thanks so much for sharing my Baked Roccan Lamb Rolls in your list of other recipes. Will share this post on FB and pin!! Thanks Gloria! I was excited to include your Moroccan-inspired dish... I pinned it to my tapas board, and hope to include it in a dinner party one of these days... Yum!